This page shows how to create a “multi” stabilized cash flow. For a chart of cash flow methods and property types, see Create stabilized cash flow. 1. Click the Underwriting tab and Assumptions sublink. Note: Each configuration of Backshop can be different. Underwriting functions might be under the Property tab. 2. Verify that the correct property is selected. 3. Enter the underwriting name, which is required. Enter as much additional information as you like. You can always return to this form. 4. Click the Update button to save your assumptions. Rental Calc: Determines how vacant space will be treated. Market Adjustment: Determines the method of any mark-to-market adjustments. Vacancy Factor: Market vacancy for the property. Concessions: The amount of free rent entered in months. Op Statement Assumption: The action (average, max or min) and the inflation factor are used to calculate all expenses except management fee. Management Fee: Calculated as a percentage of EGI. Cap Replacement Reserve per Unit: Amount held in escrow to replace common property. 1. Click the Cash Flow sublink. This opens the cash flow in the same window, within the application’s navigation system. 2. Click the Open Cash Flow in New Window button. This is ideal if you use two computer monitors. 1. The Export to Excel button gives you this cash flow in spreadsheet form. 2. Change View hides/shows the per unit and percent values. 3. 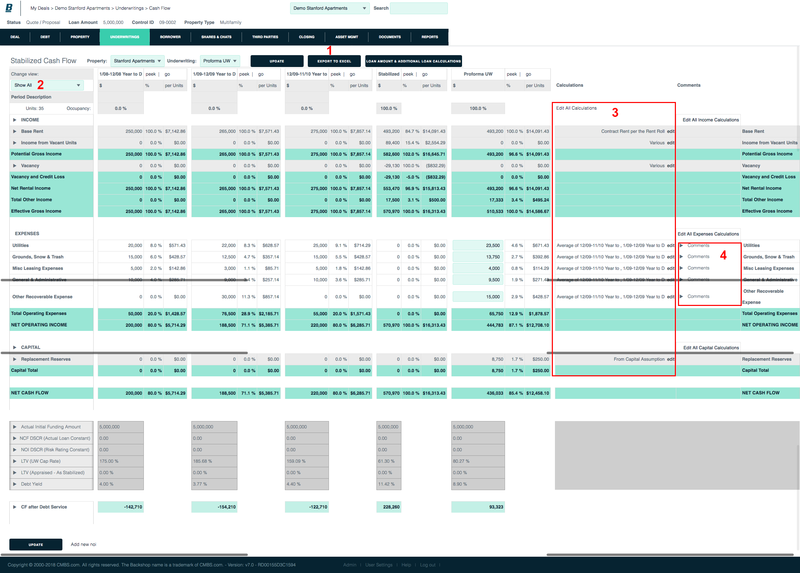 Calculations being used for the stabilized cash flow are shown in the related rows. To override the default calculations, click the Edit links. For more information, see Edit Calculations below. 4. View, edit or add comments. To override the default stabilized cash flow calculations, click one of the Edit links. 1. 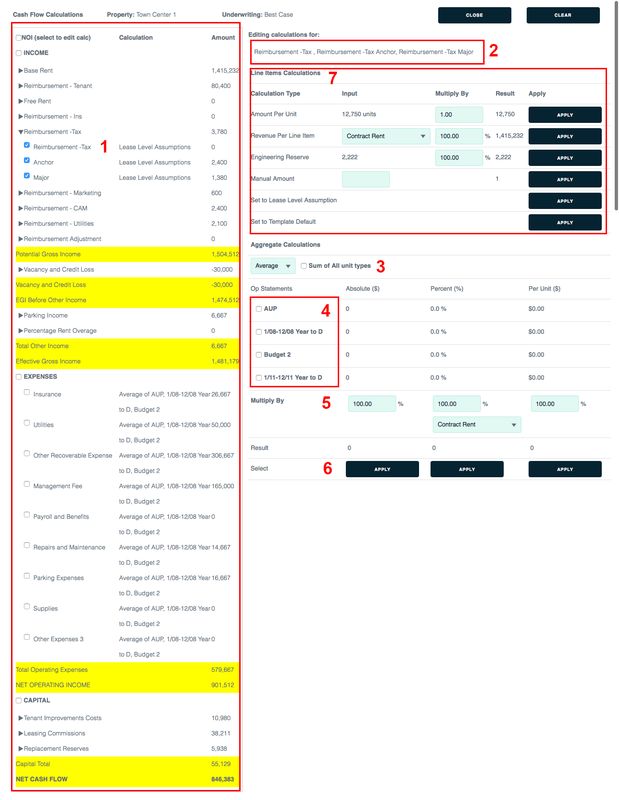 Depending on which edit link you clicked on the stabilized cash flow page (above), all NOIs, a group of NOIs or an individual NOI will be checked. Refine your selection by checking or un-checking the check boxes. Use the arrows to hide or expand categories. 2. The NOI categories you’re currently editing are displayed here. 3. Specify type of aggregate calculation: average, maximum, minimum or sum. 4. Indicate the desired data sources. Verify the U/W assumption and choose one or more op statements. 5. Enter a multiplier in the absolute, percent and/or per unit column. The new result is calculated automatically. 6. Click the Apply button for the calculation you want to activate. Clicking the Apply button executes the calculation and overrides the assumptions page. 7. Test ideas by changing inputs and multipliers. Clicking the Apply button executes the calculation and overrides the assumptions page.